Update: Was I half right? I predicted Hydro Thunder Hurricane (the Windows 8/RT app) would be made available on the phone. That didn’t quite happen, but for those who have updated to Windows Phone 8.1, Hydro Thunder Go is once-again available, just as it was for Windows Phone 7 users. 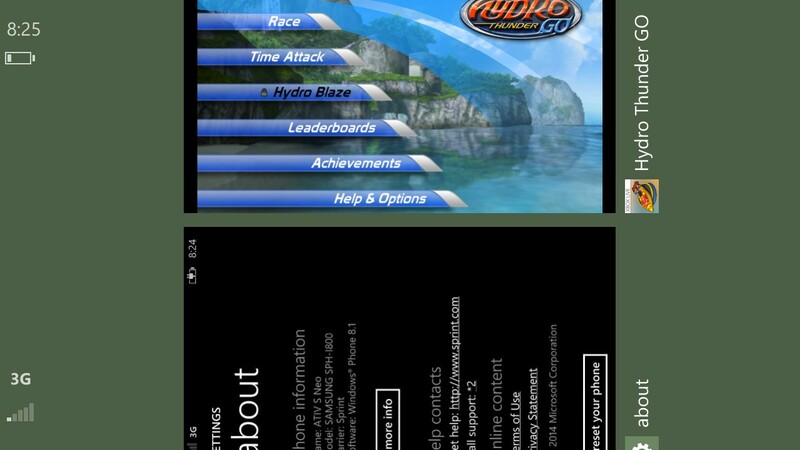 Update 2: I have been asked for more evidence that Hydro Thunder Go has appeared on Windows Phone 8.1. The best method I could come up with was by opening my “About” screen, then the game, then loading the multitasking manager and take a screenshot. So here ya go! UPDATE 3: Holy crap! So, it would seem that the release of Hydro Thunder Go on Windows Phone 8.1 was a mistake, and it has since been pulled from the App Store as the developer doesn’t wish to support it. I am frustrated and saddened by this, because the game plays flawlessly on my phone. What could the possible reason be for not wanting it out there!? I am lucky that the game still resides on my phone as long as I don’t delete it, but if I do, I will no longer be able to re-download this title. Continue to read the original article below. Windows Phone 7 was a sun rising on a horizon of Xbox gaming junkies. The first mobile phone to be Xbox Live enabled, and feature games that you know and love, as well as online leaderboards, multiplayer connectivity, and even Achievements. Gamerscore on the go. Hydro Thunder Go was an early release on Windows Phone 7 to help build the hype. 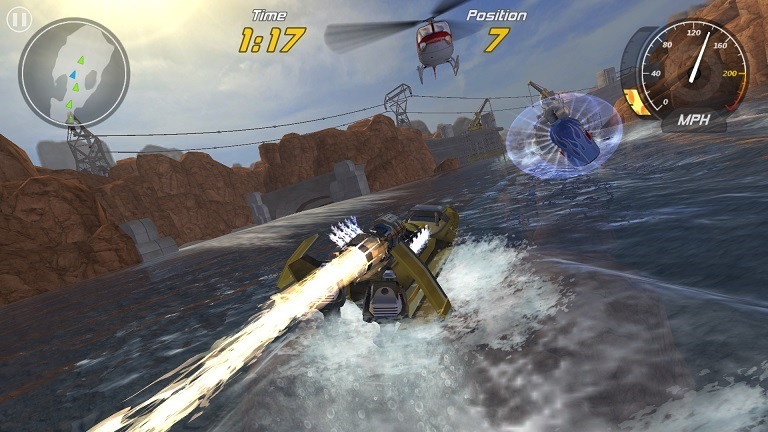 Microsoft continued the trend by releasing Hydro Thunder Hurricane on the Windows 8 store, after it had appeared on Xbox Live Arcade for the Xbox 360. When I picked up my Windows Phone 8, I was expecting to download Hydro Thunder Go from the Marketplace and play it on my beautiful new Samsung screen. No such luck. The app has not been available for Windows Phone 8. At first, I proposed that it may be due to too much fragmentation in the Microsoft ecosystem. It is not one single platform. At least, not yet. That’s where things get interesting. I believe Hydro Thunder Go is missing from Windows Phone 8 because they plan to unveil it in the next few weeks, at Build 2014, or shortly after. We have been promised, over and over, a unified code base, which would allow authors to “write once, run anywhere.” Early rumors of Windows 9 hope to make this a reality, but for a while Microsoft has hoped to combine the stores in Windows Phone 8.1 and Windows 8.1, confirming the concept as far back as last September. If this is truly achieved in Windows Phone 8.1, I fully expect to be downloading Hydro Thunder Hurricane (not the mobile “Go” version, but the full Desktop version) on my Windows Phone 8.1 handset. Hydro Thunder Hurricane was a game Microsoft made available in Windows 8 Previews, making me believe that this is a title they have a special spot for in the unveiling of the unified Windows 8.1 platform. It was an app provided early on, to show that apps in Windows 8 didn’t have to be simple time-waster games that were traditionally thought of when you heard “app.” It could be a full blown desktop gaming experience. It looks and plays beautifully on 1080p screens. I’m hoping it looks just as good on my handheld screen in the near future! What is Heartbleed, how does it affect me?